iFaqeer's Blog: Jinnah was no Ataturk. First of all I found this article on the internet while I was doing a research, and I must admit I was shocked by the abject slanders thrown here and there. I am a Turkish citizen, and still up to this day owe my presence at least as a citizen of Turkey which was founded in 1923,AT LEAST 50 YEARS BEFORE any of the so called Islam majority states of present day and yet maybe the whole South-East Asian and African colonies could ever woke up to actually ''free'' themselves.Have you ever asked yourself when Algeria became free of French colonization ? Let me answer : 1967 ! And do you think if it werent for Gandhi and a whole 380 million who supported his non-violent struggle against the British, would there be a Pakistani state ? Of course Jinnah was no Ataturk, because he did EVERYTHING Jinnah could NOT achieve.That is why he admired him of course.Neither the Muslim League nor the Khilafat Movemement was in any capability of doing much for the un-conditional freedom of the people.The Indian Sub-Continent would be free no later than Algeria if it weren't for Gandhi.The idea of Home-Rule and full independence was inspired by him and his supporters. Maulana Azad himself realized the fact and supported Gandhi to the end, he was against partition.Now as for MUstafa Kemal, yes he was a military officer already, and was not flawless. Yet his name stands there with Marschall Foch as one of the greatest commanders of WW1 and with the likes of Mahatma right there,in terms of statesmanship. You forgot how many women parliementarians were enlisted in the first elections of Turkey, and how he over and over attempted to start a multi-party democracy despite the political turmoil in the country. He was many times autocratic in that he didnt believe the socio-ecomomic fabric in Turkey was not yet ready to transform itself to achieve what he thought could be achieved.Overall a statesman with his right deeds and flaws, is responsible for the earliest free state in the ''Eastern World''(actually Turks already had an imperial state of theirs prior to that) free of Western Occupation and Mandate, and we all know without the likes of him or Gandhi their countries wouldnt be any different than Algeria or Tunisia. As for Jinnah, he is not worthy of being mentioned more than Habib Burghiba of Tunisia.Nothing less, nothing more. Let me correct a mistake here btw. Algeria became independent in 1962. I really doubt you can compare Jinnah and Attaturk. They were playing different games. They had different situations to deal with. Both of them can be credited with the founding of a nation. But only Attaturk survived to make it to statesmanship. Prior to foundation of the Republic of Turkey, Attaturk was dealing with a totally different situation as compared to Jinnah. It was a military affair - taking on the Greek, French, Russian and British forces, which had occupied Istanbul. It was a great feat, and hats off to Attaturk for handling the situation and emerging victorious. Jinnahs situation was different. Before I continue, I'll clarify your false notion about Gandhi. In your post, you make it sound like Gandhi single handedly made India free from the British and handed over 5 provinces to Jinnah. You'd need to study more Indian history before understanding the situation. I'll try to summarise here. India is a land with many different cultures, languages and ethnicities. There were the Rajputs, Marathas, Pathans, Pushtuns, Nizam, Nawabs, and ofcourse - the Mughals; and lots of factions who had a claim to rule India. After the revolution of 1857, the British Monarch dissolved the East India Company, and probed into the reasons for the revolution. Since then, the British initiated the founding of the Indian National Congress, and asked them to get representatives from every part of the country, since there wasn't any faction the Brits could really hand over the country to directly. The Indian National Congress, right from the time it was founded (1860s) till 1947 did not even cover 30 % of India in representation. There were still a lot of Princely states at the time the British left India. In my books, Sardar Patel should be credited with the Unification of India, since he was the one who managed to negotiate with the Princely states to join with India. Regarding Maulana Azad's support for Gandhi, you are again under a false notion. Maulana Azad was a representative and a candidate for the Indian National Congress. The Indian National Congress as a whole supported Gandhi (not for all his policies though). Jinnah on the other hand had completely left politics in 1920s because of the difference in leadership styles between him and Gandhi. He came back to lead the Muslim League, who were at the time equal to the Congress in electorates and representation, but were totally ignored during the 14 point plan, and generally under Gandhi's leadership. (No disrespect to Gandhiji, he didnt completely ignore muslims, just the muslim league; he just had a left-wing tendancy that would eventually make the Congress rule absolute). It is very foolish and naive to completly discredit Jinnah's contribution to the Independence of India. He was a man of vision, discipline, integrity, perseverance, audacity, and an unparalleled ability to negotiate. He is often blamed by Indians, and plenty all over the world, for the partition of India. India was parted because of the failure of the Congress and Muslim League to come to agreeable terms. Jinnah was a man of the law, an extremely talented and accomplished Barrister. Too bad, he did not live long enough to be a statesman. You can't really compare Jinnah and Attaturk. They were both from a different background. One was a Lawyer/Barrister, the other was a Soldier/Warrior. Both of them were dealing with different situations. Both of them succeeded in founding their countries. Attaturk did a great job of founding the Republic of Turkey. But as a statesman, there are numerous questionable calls and decisions. On the other hand, Jinnah is an ideal for the modern day Citizen. Always obey the law. If you feel there is an unjust law, challenge it! IMO, Jinnah had way more stones than Attaturk. It takes a lot of courage to standup to the opposition without an army backing you up. Jinnah had the unanimous leadership of his party, and his community; unlike Attaturk who used force and brutality everywhere. 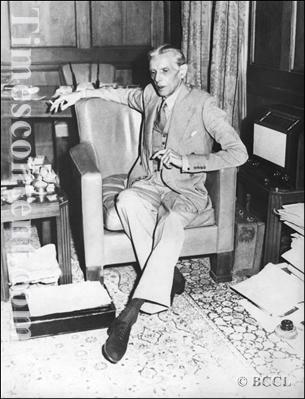 One could speculate, that Jinnah would have been an excellent statesmen with his ideals and convictions. Alas, speculations are all we can have.